Former president Manuel Zelaya has made a triumphal return to Honduras, as tens of thousands of people cheered and waved banners to welcome him home nearly two years after he was ousted in a coup. 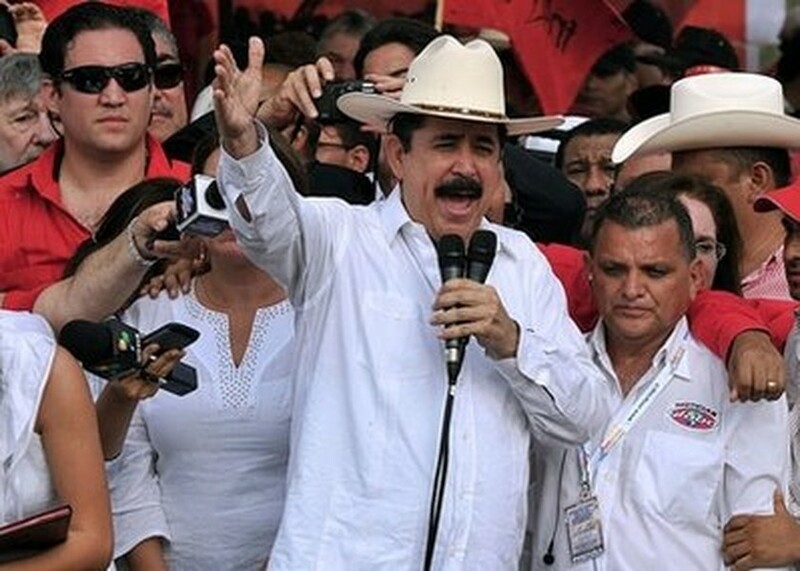 Zelaya, wearing his trademark white cowboy hat, landed in Tegucigalpa with his wife and aides aboard a Venezuelan plane on a flight from Managua, and immediately went to a nearby plaza to rally his supporters. "We arrive full of optimism and hope to search for an exit to this crisis. At one moment we had almost lost it all, but they never defeated us," he told the enthusiastic crowd, dressed mostly in red t-shirts. Zelaya, 58, thanked his supporters and paid homage to those "who spilled their blood in this plaza," including an 18 year-old shot dead during a protest a week after the coup. "Their blood was not spilled in vain because we are here still engaged in the struggle," he told the crowd. Several people fainted in the heat waiting for the former president, who was several hours behind schedule. The end of the former cattle rancher's 16-month exile was part of a deal brokered by several Latin American governments that will end Honduras diplomatic isolation and give the government of President Porfirio Lobo access to foreign investment and aid. The ousted former president is returning to lead the National Popular Resistance Front (FNRP), a movement formed after the June 2009 coup to challenge a two party system that has dominated Honduran politics since the early 20th century. "He was the only president that remembered us, the poor," said Maria Elisa Ferrufino, a 75 year-old farmer who got up at dawn Friday to catch a bus to Tegucigalpa for the rally. Zelaya "helped the poor people -- no president had done that before," said Arnulfo Mendez, 62, who traveled from a town 100 kilometers (62 miles) north of the capital for the rally. "There is hope that with his leadership we can do something with the Resistance Front." Zelaya's return will allow Honduras to rejoin the Organization of American States (OAS) and gain access to international aid, vital in a country where 70 percent of a population of nearly eight million live on four dollars or less a day. The deal included a promise that all legal action against Zelaya would be dropped. Lobo and Zelaya signed a reconciliation agreement in Colombia last week, and the two will meet at the presidential palace along with the head of the OAS, Jose Miguel Insulza, and Colombian Foreign Minister Maria Angela Holguin. Venezuelan President Hugo Chavez praised Zelaya's return as "a great victory" for the Honduran people in a Twitter message. "Down with dictatorships! Long live popular power, long live true democracy!" Chavez wrote. Zelaya, who spent most of his exile in the Dominican Republic, was a conservative rancher when he was elected in January 2006, but took a political turn to the left once in office. He was ousted in a military coup sanctioned by the Honduran legislature and the supreme court after calling for a referendum to rewrite the constitution. His opponents feared he would use it to extend his term in office as his ally Chavez had done in Venezuela. After his ouster, Zelaya secretly returned to Honduras and took refuge in the Brazilian embassy, creating a standoff that lasted four months. Meanwhile, the interim regime that ousted Zelaya held elections and Lobo took office in January 2010. Despite enjoying broad popular support, Zelaya cannot run in the 2013 presidential elections because the constitution limits presidents to a single term in office. Supporters want Zelaya's 51 year-old wife Xiomara Castro to run for president.